In the Tibetan Buddhist tradition, mantras and chants have been passed down from Lama to Lama, generation to generation. where your inner spirit can resonate. They help you just by listening, but even more by practicing to find a place of inner peace. for this musical cooperation with composer, producer and musician Margot Reisinger. balance of traditional and contemporary musical genres. Traditional Tibetan bups, bells, cymbals and horns. Talent and lifelong dedication to music made her an outstanding world musician of our time. and practices with anyone who wants to experience the Buddha Dharma. Currently Lama Tenzin is the resident teacher at the Rangjung Yeshe Gomde in Austria. a short description of each mantra and the complete texts in phonetic . I would like to give you a brief introduction to this CD. These mantras provide an extraordinary and unique method of support for everyone. In the Vajrayana Buddhist path, this is known as “Hearing Liberation”. 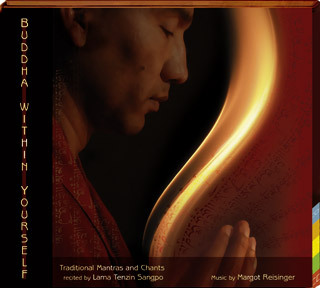 The melodies are derived from my own lineage tradition that I received very kindly from my very, very venerable master Tulku Urgyen Rinpoche and Lama Butse (also known as the great chant leader, Pema Tashi). We have included a broad range of instrumental music from around the world, which in my feeling, resonates well with these mantras and perhaps also makes them more accessible to the modern ear than only traditional Tibetan instruments. I sincerely hope all of you will derive joy from listening to them. Generally, whenever we recite mantras, at that moment we are combining deity and meditation together. Deity, mantra, and meditative absorption are central to the practice of Vajrayana Buddhism.